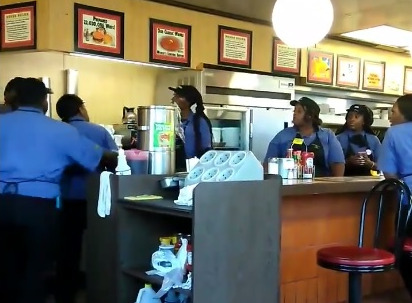 The action at Waffle Houses never seems to end, this time a fight broke out at a Memphis Waffle House and was captured on video. The video depicts workers at the restaurant arguing over whose turn it is to do the dishes when all of a sudden a physical altercation breaks out. Police responded to a call of a simple assault in the 4300 block of American Way. According to the manager, two employees got into an argument over washing dishes. They went on to tell police the alleged victim was not on the clock when another employee tried telling her to wash the dishes. The aggressor began the altercation when she pushed the victim in the back of the head while she was walking away. Other employees can be seen trying to intervene in the slap fest between the two employees. The suspect's version of events is that the other woman hit her first but the video footage is pretty clear as to who started the altercation. Police have not announced whether charges will be filed against the aggressor. The video of the altercation has gone viral and was uploaded to Facebook by Eric Cole where it has gathered over 100,000 views and 2,000 shares. Local news Fox 13 contacted Waffle House and received this statement: "The manager handled the situation immediately." People, we eat in the Jackson GA WH 2 or 3 times a week and these are incidents are very far and in between given 2000+ locations and 24/7/365 . Maybe its because we are Small town country people (White, Black and Hispanic) and understand rules for behavior in public. Maybe they need you to come up there and show them how to hire and run a good Waffle House?